This next car comes as a tip from Scott T who writes: If you're tired of pulling a trailer to the track, or you just have a fleet of unreliable cars this might be the truck for you. The seller says mint, and it looks like it is, no rust on the doors, good pics of the usual problem areas. I don't buy a lot of ramp trucks, but 6K seems reasonable. 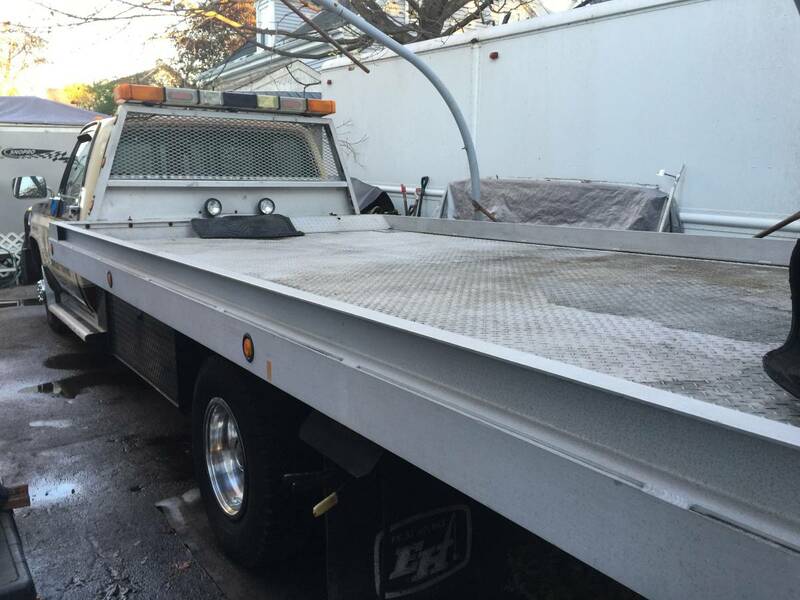 Find this 1984 GMC Ramptruck offered for $6000 in Boston, MA via craigslist. 1984 GMC RAMPTRUCK ONLY 2 OWNERS! 2 DRIVERS SINCE NEW! New Chevy Dealer installed STRONG 350 4bbl ENGINE THAT RUNS PERFECTLY! All Steel Brake Lines and Rubber Brake Hoses Throughout! New Fuel Pump W/Fuel Line to Carb. Other UpGrades performed several years ago but Truck Sitting since. Medical. Dual "Large" Frame Mounted Heavy Duty Steel Underbed Toolboxes. Cab Roof Lights. Truck truly looks Awesome Lit up at night! Mint Aluminum Jerr-Dan 18' Diamond Plated Deck! No Dents! NoWaves! NEWER JERR-DAN BODY WILL ACCEPT A WHEEL LIFT UNIT! MILO LINE LOCK HYDRAULIC "FRONT WHEEL LOCKING BRAKE SYSTEM"
*NOT INTERESTED IN ANY TRADES! $6,000! CA$H ONLY! NON NEGOTIABLE! *AVAILABLE! WILL DELETE POST WHEN SOLD! 👉🏻WILL ANSWER ALL QUESTIONS BY TELEPHONE ONLY! 👉🏻I ONLY RESPOND TO EMAILS WITH A TELEPHONE NUMBER! PERIOD! 👉🏻PLEASE SEND A PHONE # FOR INFO/APPOINTMENT! THANK YOU! *TRUCK IS AVAILABLE RIGHT NOW FOR IMEDIATE PURCHASE! No doubt this is a nice truck for 6 large. It is a roll back though as pointed out above. Looks more butterscotch&toffee than mint.